CHICAGO — Jerry Nelson's career for 11 years — the one he went to school for, dressed up for, made money at — was in architecture. Brewing beer was his hobby. Three years ago, the hops won out. That's when the former Marine and Rogers Park native decided that what he most wanted to build wasn't homes, but a brewery. He started looking for a space last fall. In May, he found a 2,500-square-foot room in a warehouse at 1640 W. Hubbard, and Une Annee Brewery was born. In early September, Nelson poured the first three Une Annee beers — a Belgian IPA, Golden Strong and Saison — at a release party at Fountainhead in Ravenswood. "I saw the success that [Chicago breweries] Metropolitan and Half Acre have had. Other cities have been booming, craft beerwise, for a while. It was that same feeling, that this can be done in Chicago," Nelson, 39, said. These are heady times in Chicago for brewers like Nelson and drinkers of craft beer, who are more than willing to travel for it (Dark Lord Day, anyone?). Illinois is home to more than 80 craft breweries, up from 67 in 2012, according to the Brewers Association, a Colorado-based trade group that keeps tabs on the industry. There are plenty more to come. The association counts some 30 craft breweries in "planning" within the city limits and 62 more statewide. Nationally, breweries are opening at a rate of more than one a day, said Bart Watson, staff economist at the Brewers Association. Craft beer hasn't quite taken over the world. It still makes up only 6.5 percent of the American beer market. But the small, mighty cousin to mass-market beer is the life of the party these days. While overall U.S. beer sales were down 2 percent for the first half of 2013, sales of craft beer in the same period rose 15 percent by dollars and 13 percent by volume, according to the Brewers Association. "Consumers have figured out that craft beer isn't necessarily just some big, gnarly, hoppy thing or some massive Imperial Stout," said Jonathan Cutler, the brewer at Piece Brewery and Pizzeria in Wicker Park, which opened in 2001. "There are so many different variations of certain styles." And there is no shortage of ways for Chicago beer geeks to indulge, from big events — the Festival of Wood and Barrel Aged Beer in November (tickets sold out in four minutes) and Beer Under Glass, the kickoff to the 11-day Chicago Craft Beer Week in May — to beer dinners and tastings at neighborhood restaurants and corner taverns. The highest profile and certainly the largest addition to Chicago's craft beer scene this year will be Lagunitas Brewing Co., based in Petaluma, Calif. By year's end, the doors should be open and the tanks running at its $22 million brewing facility in Douglas Park. The facility will produce 250,000 barrels a year to start and ramp up to 1.7 million barrels, expanding Lagunitas' reach eastward and making it the second-largest craft brewer in the nation and "the biggest brewery in Illinois since the Chicago Fire," said Lagunitas founder Tony Magee. Opening the Chicago facility makes good business sense, but emotion plays a part, said Magee, an Arlington Heights native who started Lagunitas in 1993. "We want to be close to the people in the markets where we sell beer," Magee said. "Craft beer is so personal. People take it so personally. We want to share that we-ness." On the other end of the size spectrum, but as exciting for local beer fans: cult favorite Pipeworks Brewing plans to open a bottle shop at 1673 N. Western Ave. next year, according to a recent Facebook post. 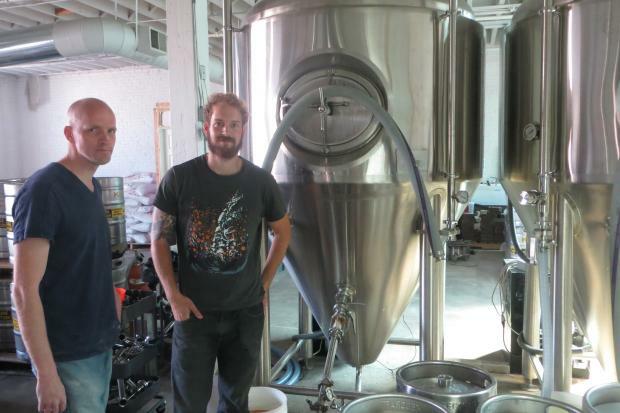 Much has happened for the Wicker Park brewery in a short amount of time. It got its start through a Kickstarter campaign and began kicking out beers in early 2012. In January, the beer enthusiast website RateBeer.com named Pipeworks the world's best new brewery. Chicago is leading the trend of these nanobreweries, said Josh Deth, the owner of Logan Square's Revolution Brewing, which in its three years has become a household name on the local scene. Deth and others talk of a supportive community, where startups collaborate and fledgling brewers can and often do hop from brewery to brewery, learning the craft. For formal training, there is the Siebel Institute of Technology, the nation's oldest brewing school, which this month moved its campus from Clybourn Avenue near the original Goose Island brewpub to the ground floor of Kendall College. Enrollment at Siebel has been on an uptick for the last five years, with Web-based courses seeing triple the number of students, said vice president Keith Lemcke. Several hundred students complete the program each year, he said. The majority are home-brewers who like Nelson, himself a Siebel graduate, want to move out of the garage and into the commercial market. "Many do have opening their own brewery in mind," Lemcke said. Chicago is a beer kind of town. German immigrants made it so in the 19th century with the city's first commercial brewery. By 1900, there were some 60 breweries churning out more than 100 million gallons of beer annually, satisfying the demand of the burgeoning German and Irish populations, according to the Newberry Library's Encyclopedia of Chicago. Most of those breweries, however, didn't make it past the repeal of Prohibition and the rise of canned beer. Today, MillerCoors has its headquarters here. Anheuser-Busch InBev staked its claim with the 2011 acquisition of homegrown brand and craft beer pioneer Goose Island Brewing Co., and its exclusive partnership with the Chicago Cubs. But craft beer — the stuff that in general terms and by Brewers Association standards is "small, independent and traditional" in production and vibe — is a more recent and distinct phenomenon. When beer aficionado Randy Mosher moved here from Cincinnati in 1985, "There was no craft beer here at all," said the noted author and creative consultant to the craft beer industry. The few earliest attempts, by Siebens River North Brewery and Tap and Growler in the West Loop, were "pretty horrible," he said. The opening of Goose Island in 1988 changed everything. "Once they opened, it was like, 'Hallelujah,' " Mosher said. "Those guys are just very good at not making mistakes." The steady success of Goose Island was the kindling for other breweries to open and gain an audience — Three Floyds in Munster, Ind., and Two Brothers in west suburban Warrenville, Rock Bottom and Piece in the city, and several years later, Half Acre and Metropolitan. And then, in just the last few years, the floodgates opened. "It's crazy to think about how many people are trying or planning on opening breweries right now," said Piece's Cutler, whose 12 years and numerous awards at the Wicker Park brewpub have made him something of an elder statesman among his peers. He and others say the boom mirrors what has happened in the culinary world, as restaurants multiply and diners gravitate toward all things local, seasonal and small-batch. "People have really done a full 180 on how they go about spending money, and it's not exclusive to beer. There's this attention to locality, whether it's with beer or bread or a lot of things," said Gabriel Magliaro, founder of Half Acre. And as with restaurants, there's just a lot more beer to go around, from established names like Half Acre to under-the-radar operations such as Spiteful. The result: an incredible diversity, some say more so than in other beer-centric cities. Mosher is creative director at 5 Rabbit Cerveceria, which makes Latin-style brews. Metropolitan specializes in lagers. Une Annee will focus on Belgian beers. Pipeworks is known for beers that are "kind of all over the place," Mosher said. "Say you go to San Diego, which is famous for its India pale ales. You're out at a bar, and you don't like IPAs, you're kind of s--- out of luck," Mosher said. "Chicago is a good city for beer diversity, maybe one of the best. And I think that reflects the general gist of Chicago. Think about the food — you can get everything here." The interplay between the restaurant and brewing worlds in Chicago isn't lost on Jared Rouben, who is working toward a December opening of Moody Tongue Brewing Co. in an old glass factory in Pilsen. Rouben, 31, is a culinary school graduate, a chef and, most notably, former brewmaster at Goose Island, where he partnered with local chefs to make beers tailored to them and their restaurants. He did more than 50 such collaborations. "Especially in Chicago, chefs have really embraced beer," he said. Rouben calls his style "culinary brewing." That is, making beer, such as a gingerbread chocolate milk stout that will be Moody Tongue's first release, using techniques and ingredients from the kitchen. "In a brewery, you see these giant tanks. Take that tank and imagine you're in a kitchen. It's really just a pot," he said. "Cooking might take three minutes. Baking takes three hours. Brewing takes three months." Down the road, Rouben said he envisions setting up a sort of cross-culture training program, where a brewer might swap places with a sous chef to expose each to the other's craft. Store shelves are crammed with more craft beers than ever, but industry watchers insist Chicago hasn't yet hit its saturation point. "No way. Every brewery uses different tanks, different water, so there's a different flavor profile for every type of beer," said Justin Maynard, executive director of the nonprofit Illinois Craft Brewers Guild. Expansion is on a lot of brewers' minds. Metropolitan has outgrown its current facility in Ravenswood and is on the move to a bigger one, while 5 Rabbit Half Acre is now distributing its beers in Ohio with an eye on Indiana and Kentucky as well. Half Acre is developing a "food concept" in the space just south of its North Center brewery, Magliaro said. With growth come hiccups and a real concern about not compromising quality or the craft ideals. Even Lagunitas' Magee knows this. "Big hasn't been done cool yet," Magee said. "For us, I think we can get big, and as long as we don't lose our way and make decisions based on market research, and do things that are soulful, people will recognize that." Magliaro's advice to the flurry of newcomers: "Figure out your beer, and if you're going to make mistakes, try to keep them as close to your brewery as possible, because there's a spotlight on everybody now." Making it easier for craft brewers to thrive in Illinois is a priority for the Illinois Craft Brewers Guild. Maynard said a newly formed governmental affairs committee will take up that work in Springfield next year, in hopes of revising what it sees as outdated liquor laws regarding production and distribution. The guild scored what Maynard called a "minor" win in August with legislation doubling the amount of beer a craft brewer can make annually, from 15,000 to 30,000 barrels. Still, it fell far short of the 200,000-barrel mark the guild and its members were pushing for. At Une Annee, Jerry Nelson brews in eight-barrel batches. His goal is to get up to 2,000 barrels a year as he adds fermentation tanks. It's all part of the business plan he labored over before opening Une Annee. "I wanted to make sure I had a full chance of succeeding. I opened as the only employee and with no debt. Those are two very vital factors," he said. Nelson looked for a space that didn't require a gut rehab and kept to a $100,000 budget to get up and running. He has since hired an employee, Dustin Zimmerman, fresh off a three-month internship at the Nogne O brewery in Norway. This is Nelson's life now. He brews on Thursdays — he recently had a 16-hour marathon brewing session — and spends the other days drumming up new business. A distribution agreement with powerhouse Wirtz Beverage, effective Oct. 15, should move things along nicely. Nelson maintains his architecture license, in case he ever wants to go back to building houses. Except, for now, he doesn't.